As our office documented a year ago, housing affordability truly is a statewide challenge. It is a major concern in our fast-growing urban areas, and throughout rural Oregon as well. In fact, rural Oregonian incomes are on par with rural American incomes, however home prices are 30 percent higher here and rents are 16 percent higher. 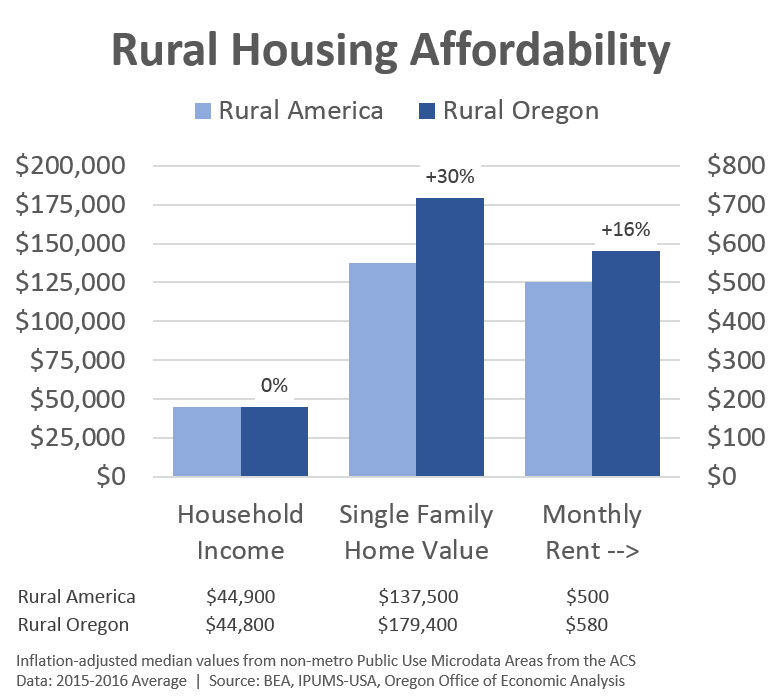 These differences mean rural Oregon faces an affordability crunch. Pinpointing the exact reason for rural Oregon’s housing challenges can be difficult, however the data do tell a clear, or at least a consistent story. First, rural Oregon has experienced faster population growth than the rest of rural America — 50% faster growth in the 1990s and twice as fast in the 2000s to date. This results in stronger demand for housing. Given that new construction is almost always more expensive compared to the older housing stock, a more modern mix of housing, or a larger share of newer homes can lead to higher prices when looking at the market overall. This does not appear to be the case in rural Oregon, however. There is not a larger share of homes built in the last decade or two. Housing prices in rural Oregon are more expensive than their national counterparts for all types of units and for all vintages in the housing stock. As such, if a region experiences faster population growth but an average amount of new construction overall, that means the region is building less on a population-adjusted basis and the vacancy rate is falling. This is exactly the case in rural Oregon, where new construction since 2000 is approximately 30 percent less than in rural America on a population-adjusted basis. The result is rural Oregon’s vacancy rate is now nearly 2 percentage points lower than in rural America, while it was essentially the same back in 2000. Stronger demand coupled with limited supply is the classic recipe for rising prices. This is the story the data tells of rural Oregon’s housing crunch, when compared with rural America overall. While these problems are more pronounced here in Oregon, unfortunately, they are not entirely unique. The lack of housing supply in Oregon’s urban areas, and in the other popular and fast-growing metropolitan regions of the country has eroded affordability everywhere. The lack of credit for single family developers and for land acquisition and development loans in particular appears to be a root issue impacting the supply. For more on the causes of the housing shortage, see our office’s previous report. That said, some regions of rural American and rural Oregon face additional challenges in the form of vacation homes. Many ski resorts and coastal communities have housing markets based in large part on external demand rather than on local economic conditions. This places increased pressure on moderately priced homes, or so-called workforce housing. Along Oregon’s coast this issue is particularly pronounced. 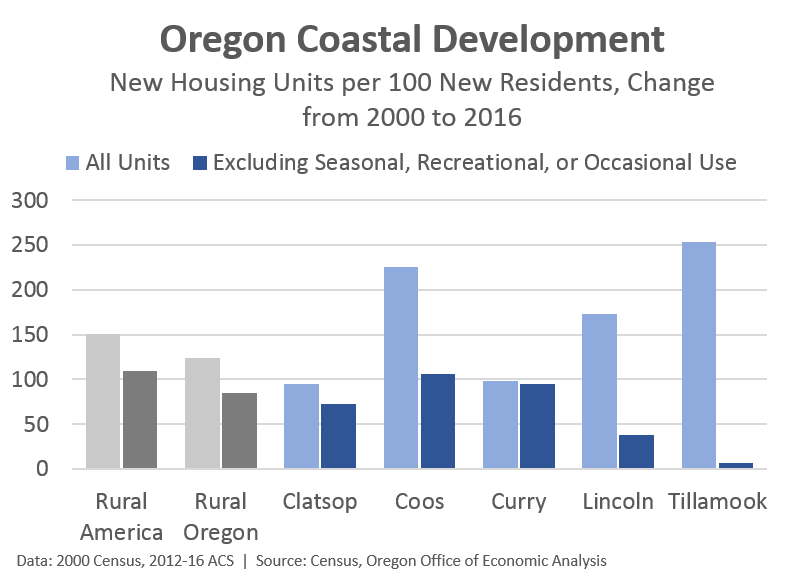 Both Lincoln and Tillamook counties have built an above average amount of housing in recent decades, at least relative to population growth. However after factoring in new developments targeted specifically as vacation homes, and an overall increase in vacation homes in general, the stock of workforce housing, or for local residents has barely increased. These pressures make affordability especially challenging for local residents. Furthermore, it also makes it difficult for local businesses to hire and retain workers, and results in longer commutes for individuals taking these jobs. Finding a policy prescription to these issues is particularly challenging. I know some proposals suggest building more housing in, say, Otis and Toledo instead of Lincoln City and Newport. Additionally, Warrenton has historically absorbed some of Clatsop County’s growth whereas Astoria less so. However as The Daily Astorian detailed in their housing crunch series last year, Warrenton too faces housing affordability challenges in addition to political or societal objections to new construction. Obviously, more construction is needed everywhere to better align housing availability with demand if we hope to see better affordability moving forward. Our office’s baseline outlook does expect somewhat better market balance in the coming years with a continued pick-up in new construction coupled with slowing population growth. That said, expectations are not for a perfectly balanced market. That is unlikely to happen unless we see significantly stronger construction trends or a sizable reduction in demand which is unlikely to occur until the next recession. As such, affordability will remain a challenge in the near-term. Fortunately Oregon now has better household income gains that are helping with affordability via the denominator (income) rather than the numerator (housing costs). 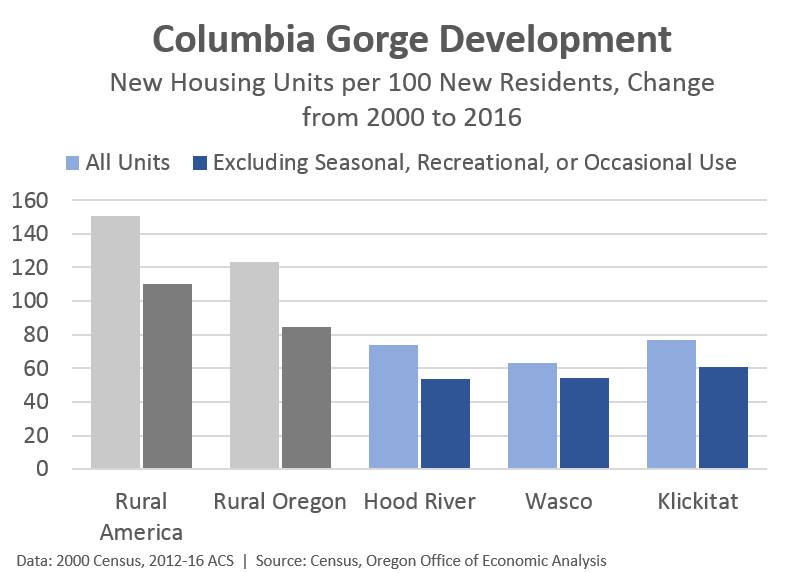 Update: Here is a similar chart for new construction activity in the Gorge, by request.